The more recherché fourth bovine stomach, or abomasum in English, the name is derived from its resemblance to the mouth of a lamprey, which used to be very common in the River Arno. 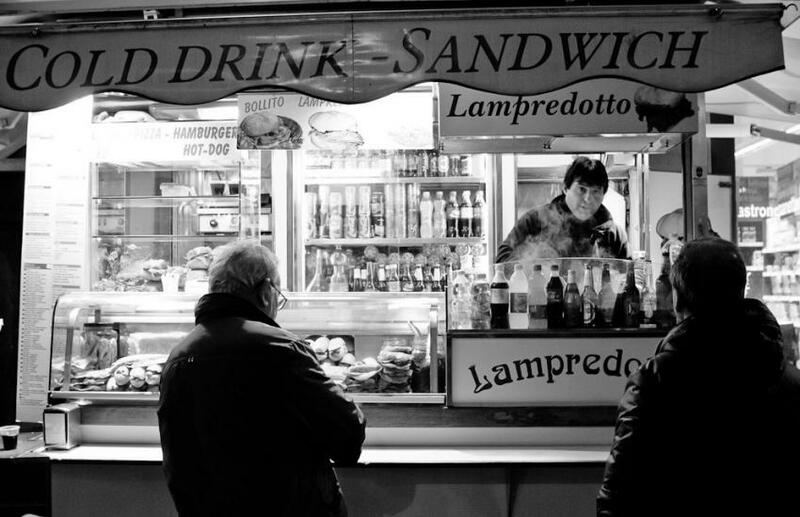 By the 15th century lampredotto sandwiches were being sold at Florentine tripe stands, and were a favourite workmen's snack. Today lampredotto is offered at tripe vans and stands throughout the city centre (those who specialize in it are called lampredottai) along with the typical trippa alla fiorentina made from honeycomb tripe. For each order, a gelatinous slab is fished out a steaming vat of broth, thinly sliced, stuffed in a crusty bun that has been dipped (bagnata) in the cooking broth and seasoned with a dollop of salsa verde or salsa piccante made with chillis. If you want it less fatty, you can order it sbucciato, although it will have an even stronger taste. Other less common names include caglio, francese, frezza, quaglietto and ricciolotta.